The poleward branches of the Hadley Cells and the edge of the tropics show a robust poleward shift during the satellite era, leading to concerns over the possible encroachment of the globe’s subtropical dry zones into currently temperate climates. The extent to which this trend is caused by anthropogenic forcing versus internal variability remains the subject of considerable debate. 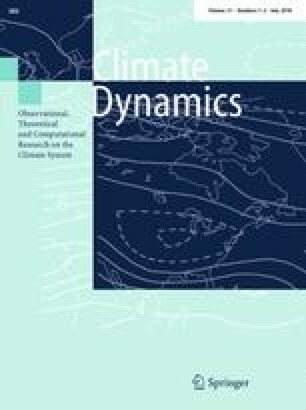 In this study, we use a Joint EOF method to identify two distinct modes of tropical width variability: (1) an anthropogenically-forced mode, which we identify using a 20-member simulation of the historical climate, and (2) an internal mode, which we identify using a 1000-year pre-industrial control simulation. The forced mode is found to be closely related to the top of the atmosphere radiative imbalance and exhibits a long-term trend since 1860, while the internal mode is essentially indistinguishable from the El Niño Southern Oscillation. Together these two modes explain an average of 70% of the interannual variability seen in model “edge indices” over the historical period. Since 1980, the superposition of forced and internal modes has resulted in a period of accelerated Hadley Cell expansion and decelerated global warming (i.e., the “hiatus”). A comparison of the change in these modes since 1980 indicates that by 2013 the signal has emerged above the noise of internal variability in the Southern Hemisphere, but not in the Northern Hemisphere, with the latter also exhibiting strong zonal asymmetry, particularly in the North Atlantic. Our results highlight the important interplay of internal and forced modes of tropical width change and improve our understanding of the interannual variability and long-term trend seen in observations. This material is based upon work supported in part by the National Science Foundation Graduate Research Fellowship (NSF; DGE-1144086). N. S. and S. P. X. are supported by the NSF (1637450). S. P. X. is further supported by the National Key R&D Program of China (2016YFA0601804). A. J. M is supported by the NSF (OCE1419306) and the National Oceanic and Atmospheric Administration (NOAA; NA14OAR4310276). We would like to thank Sarah M. Kang and Kristopher Karnauskas for their helpful comments during the course of our study. We also thank Yu Kosaka for running the additional 10-member GFDL-CM2.1 ensemble and the 1000-year control simulation. We also express our gratitude to the World Climate Research Programme’s Working Group on Coupled Modelling, which maintains CMIP. MERRA2 Reanalysis data was provided by the NASA Global Modeling and Assimilation Office, from their web site at https://gmao.gsfc.nasa.gov/reanalysis/MERRA-2/. Finally, we’d like to thank two anonymous reviewers for comments that improved the quality of this paper.